I was halfway through the golf season this year before I buckled down to finding a new putter. I’d been sort of searching since the end of last season, ever since my putter grew legs and walked away from the Brattleboro Country Club. Unless I left it leaning against a tree deep in the woods someone must have retrieved it, but it was never turned into the pro shop. Ever since I’ve been glancing stealthily at players on the practice putting green to see if they had a guilty aspect or, more tellingly, my old putter in their perfidious hands. No luck. Putters are the most individual clubs in our bags, usually the only one with a singular name as it’s not part of a set of fairway clubs or irons that are probably signified by some weird number anyway—the PU-007, the SCKX 99, the WTF Tour Series. 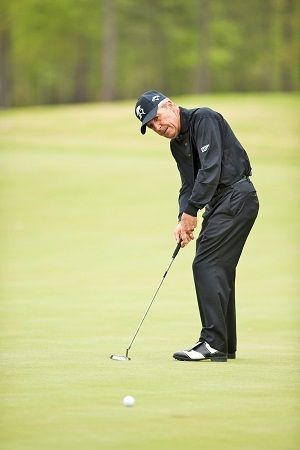 Greg Norman is of the school that periodically metes out putter discipline: “You have to put your putter out to pasture every so often, let it eat and get fat so it can get more birdies.” No one beats pro Ky Laffoon, though, a story I’ve mentioned before, who was once so mad at his naughty putter that he tied it to his car and dragged it 400 miles to the next tournament. Pondering my own golfing life, though I’ve felt like snapping a few putters over my knee I never have; I do banish them to the garage though if a period of discontent ensues. I suppose I’m more of a serial philanderer when it comes to putters; I’ll stick with one for a goodly period, but eventually something flashier waltzes by and turns my head. But the current search began out of necessity, hence in all innocence. 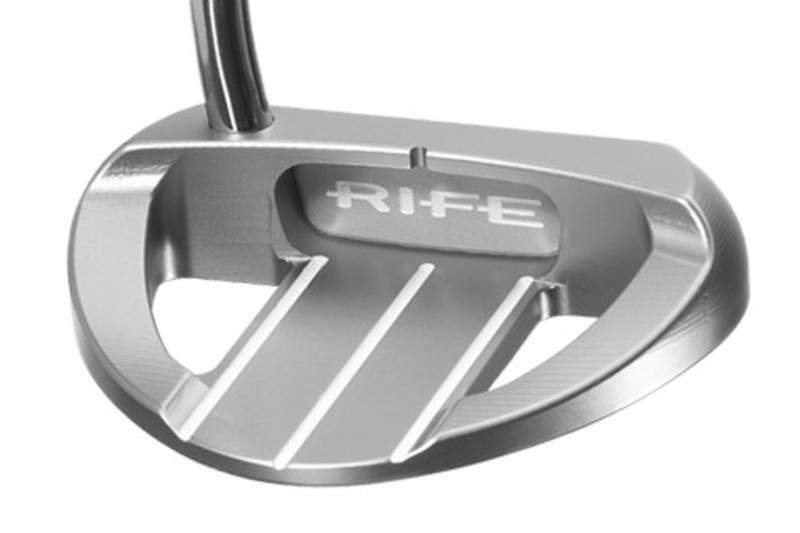 I’d been contentedly using a Rife Barbados putter for years, my first mallet, giving me a feel that made it clear I would likely never return to a blade. While at this year’s PGA Merchandise Show in Orlando in January I made it my mission to check out as many new putters as possible. I saw some strange ones, but then that’s nothing new. As the New York Times reported, “The finale in freak putters has apparently not yet come, for after nearly every shape of iron, wood and aluminum had been exhausted… a Chicago professional has come to the front with a putter made of gaspipe.” And this report was from 1922! This year one putter was made out of a solid oblong block of transparent acrylic and could stand by itself on the green, giving a player the ability to see the ball through the back of the putter and easily square it up to the target line. Invented by a Swiss surgeon who has 23 patents for nose and hearing implants, the Iceblock Putter is easily the gaspipe model of its day. I eventually requested seven putters from manufacturers, but timing and availability issues kept the arrivals down to four, the Argolf Pendragon, the Bloodline RG-1 Mallet, the MLA Tour Mallet Black Edition, and the PING Sigma G Tyne. 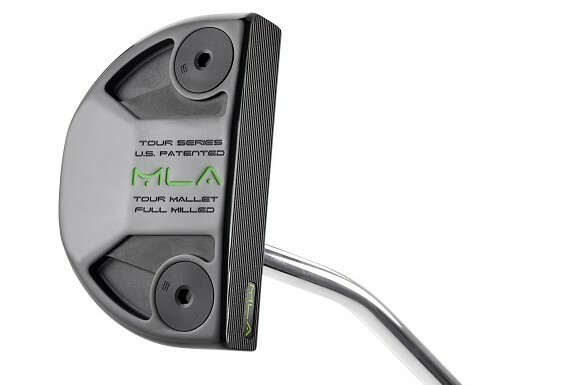 The MLA Tour Mallet ($349 MSRP) was the first to arrive and I immediately took it out to a putting green and put it in play in my next round. I liked it right from the start, not in the least because it reminded me of my missing-in-action Rife putter, a mid-sized mallet with a 34” shaft mid-way between heel and center. A Swiss company, MLA Golf stands for Multiple Line Activation, an alignment technology design the science of which I wasn’t too concerned about (are we ever? ), and an interchangeable weight system of which I figured would only confuse me at some point, but okay. Mainly, the putter looked good, felt good, and rolled well. The other three putters all arrived on the same day and with deadline time running short* I immediately took them out to a putting green and put them all in play in my next round. Trial by fire. I have to say, I liked all of these, too, and my putting was clearly better than with the interim blade that had been pressed into service. Argolf was founded in Brittany by two French aeronautical industrialists, hence putters named after Arthurian legends (though headquarters has since been moved to Florida). Kenny Perry put the Pendragon model ($349) into his bag right before winning the U.S. Senior Open in July. It was easily the best-looking putter of the four, with a black matte finish, the most pronounced heft, pleasing white sight lines, no inserts to mess with my mind, and a 33” heel shaft, which was a tad shorter than the others, but fine by me. The Bloodline RG-1 ($499) comes from golf equipment industry veterans Brad Adams and Larry Bischmann, with former ties to Odyssey and TaylorMade and family members who also worked in the industry, hence the name. 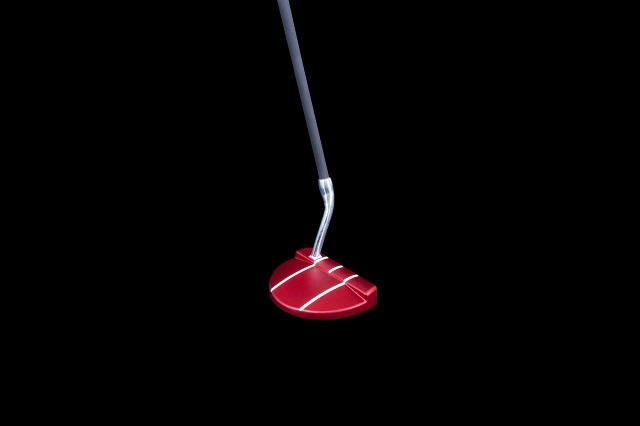 But the putter itself is an attractive red with white sight lines. The Bloodline was perhaps the odd man out in terms of looks and feel. Like the Iceblock Putter, it can stand on its own on the green and allows a player to line up a shot effortlessly (if not transparently). It was the lightest of the lot, but with an oversized rounded grip that I didn’t particularly care for. Nonetheless the Bloodline had the softest, almost creamy feel of the ball off the face, and it seemed to be dropping an awful lot of putts. 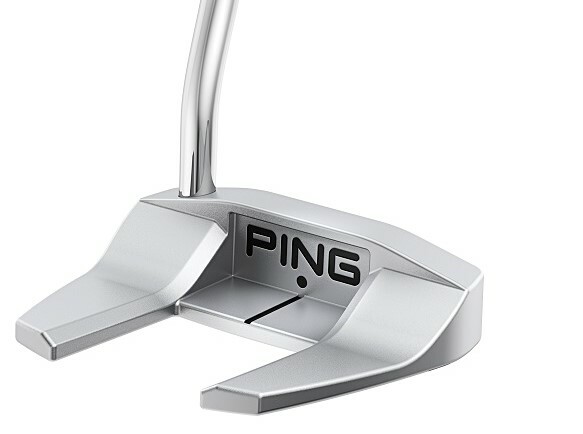 Little need be said about PING and its long history with quality putters. 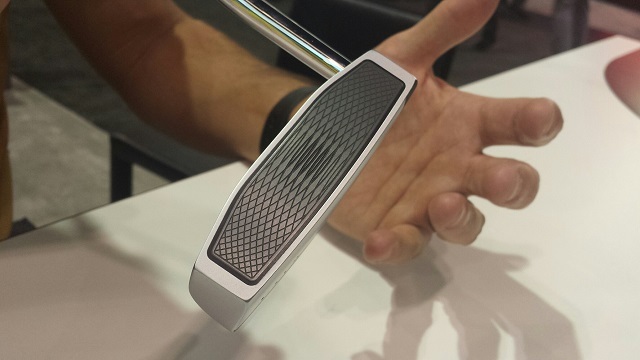 At the PGA Show I had seen and tried several models that appealed to me in the new Sigma G line, a series with full aluminum milled faces that seek to deliver softer feel and sound without losing energy, and delivering a true roll even with mishits. I requested a new Tyne model and PING manufactured it in record time. The Tyne has a simple elegance, a silver wing design with a single black alignment stripe, heel shafted with a pistol grip and the lowest price ($215) of this quartet. Did I pick a winner, the club that will go in the bag for at least a few years, before it grows legs and walks away? Not quite—testing will go on, and though I think all four putters could help me out, here’s where things get a little silly: I’m giving the edge to the PING Tyne and the MLA Tour Mallet because both score well in the Gimme Scoop Up category. 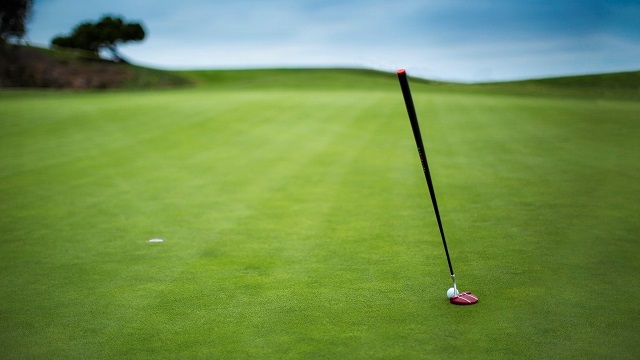 In other words, with both putters it’s easy to sweep the ball up from the turf after a conceded putt—with the PING you can actually pick the ball up. Whereas the Pendragon has a low lip on the putter back, it’s not low enough for an easy scoop; the Bloodline has a thick rounded back and no scoopability whatsoever. Granted, this may not be—and probably should not be—the most important feature about a putter. But I’m not getting any younger, and if I can avoid bending down a few more times during a round, it’s important to me. Besides, I have Ben Hogan backing me up on this one: To each his own. *This piece originally appeared in the August-September 2017 issue of Golf Oklahoma magazine, in slightly different form. Enjoyed the article, but that $500 putter will have to rest in a bag other than mine.